Use a Four Star Solar Power Center at the heart of your off-grid power system. 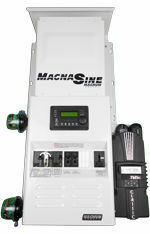 The inverter system, also called the "power center," is the most important part of your solar power system. This combo of inverter(s), charge controller(s) and safety components is responsible for running your renewable energy power system. Four Star Solar Power Centers are pre-assembled onto handsome, gray or white metal mounting plates. This plate contains all the gear that converts DC electricity produced by your solar panels, wind turbines or gas generator into useable 120 or 240 volt AC power and directs it into your home, business, workshop or cabin. The Four Star Solar Power Center makes energy measurement a breeze. One glance at the digital display and you can see how much energy your system is producing and how much you are using. Four Star Solar’s manufacturer-trained technicians do the work (and take the risk) for you. 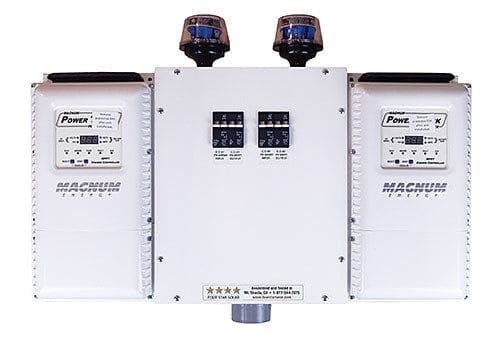 They mount and wire your system's power inverter(s), solar charge controller(s), safety disconnects, surge suppressors, breakers and meters into a clean, compact system that's ready to hang on your wall. Four Star Solar's pre-wired and fully tested power centers come with all the necessary balance of system components installed and pre-wired to get your system up and running as quickly and safely as possible. Four Star Solar is able to pass on excellent pricing on the “guts” of your solar electric system because they buy all components in quantities at wholesale prices. Plus, their skilled technicians are able to assemble, wire and test power centers in an efficient, timely manner. No need to wrestle with wiring it yourself, or trying to track down and pay a professional electrician. In addition to the Inverter Power Centers you find listed here on the website, Four Star Solar can also customize components to meet your unique needs.